The Edinburgh Festivals...Bring It On! Where are the Edinburgh International and Fringe Festivals held? The Edinburgh Festivals are held in venues all over the Scottish capital of Edinburgh. Grab an International Festival Guide or Fringe Festival Program from the websites for exact venues, dates and details to plot your attack, or simply take to the streets and let the Festivals come to you. When are the Edinburgh International and Fringe Festivals on? The Edinburgh International and Fringe Festivals from alongside each other throughout August and sometime into September each year. In 2014 the Fringe Festival will be on from 1 August to 25 August. This year the International Festival gets underway on 8 August and concludes on 1 September. Edinburgh's International Festival presents a diverse and rich mix of classical, dance, drama and opera productions performed in some of the city's most loved and iconic venues, including the circular Usher Hall and the magnificent glass-fronted Edinburgh Festival Theater. It's an invitation to the world's greatest artists to perform in one of Europe's most culturally active cities. The Festival rounds things off with a massive fireworks display from Edinburgh Castle that lights up the autumn sky above the crowds in Princes Street Gardens, to the strains of classical music from the Scottish Chamber Orchestra. Join the masses for 25 days this August as the streets and venues of Edinburgh come alive with unbridled creativity. Every year thousands of performers take to a multitude of stages (and soapboxes and street corners) all over Edinburgh to present a huge diversity of shows and performances that cater for every imaginable taste. From the biggest names in comedy, theatre and entertainment to unknown artists looking to enhance their fledgling careers, Ed Fringe never fails to deliver memorable performances across a multitude of genres ranging from physical theatre through to cutting edge satire. Take nothing for granted at the greatest cultural show on earth in one of its most spectacular cities. To be in Edinburgh for both the International Festival and Fringe Festival is one of the must-do travel experiences. We have extensive information on travel and tour options available for both Edinburgh Festivals. With hundreds of thousands of people going to the festivals each year, Edinburgh becomes a very busy place and available accommodation, trains and flights to Edinburgh can become hard to come by. We advise you to book as early as you possibly can. If you are an independent traveller and you like to book it all yourself, then we have all the tools required for you to get the best out your Edinburgh Festivals experience. Check out our Accommodation booking page, where you will find both our Hotel and Hostel Search Engines. If you need to book flights, we have a great Flight Search Engine that searches hundreds of online travel and airline websites to find you the best deal. With all our search engines all deals are located on one easy page for you to click, compare and book. If you're already in the United Kingdom, before going to the Edinburgh Festivals, or if you are planning on travelling around the UK or Europe afterwards, then it might be easier to look at train travel in and out of Edinburgh. Check out our Rail Europe page, where you can purchase tickets and passes, as well as check train schedules. 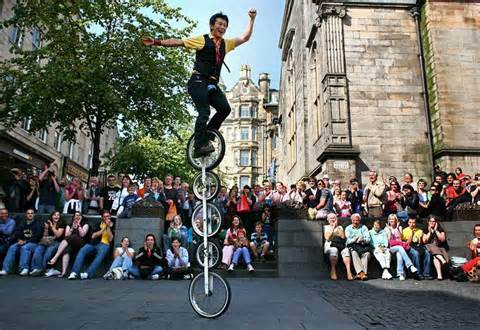 One of the easiest ways to enjoy the Edinburgh Festivals is to join one of the many tours on offer. We have some information on a few of the great tour operators for both the Edinburgh International and Fringe Festivals. The following tour operators are some of the biggest and best in the business and they will be sure to provide you with an amazing experience that is sure to cure your travel FOMO. The Contiki Edinburgh Festivals tour starts and finishes in London. This 4 day full guided trip uses hotel accommodation with shared facilities and a continental breakfast each morning. Included in the Contiki Edinburgh Festival Trip is a ticket to the closing night of the Edinburgh Military Tattoo, as well as a sightseeing tour of Edinburgh. Stoke Travel will be putting on their cultural caps for 3 night trips for the Edinburgh Fringe Festival. Your stay in Edinburgh will be at a centrally located hostel, where cheap drinks will be on offer at the hostel bar. They will also take you on a stroll through the city to soak in the history and visit a few pubs to try local delicacies like black pudding and ale. You will also get to see 3 awesome live performances each night. Also included in the Stoke Travel Edinburgh Fringe Festival Trip will be dorm room accommodation with breakfast every morning and the services of a Stoke Travel Guide. Stoke Passport Holders can get a 3 nights stay in Edinburgh for the Fringe Festival with breakfast and the other inclusions listed above.